13 Action News has a wonderful update on a little Las Vegas boy with autism who we met one year ago. Four-year-old Thomas Bernard has made tremendous progress. He used to be almost non-verbal and now he can talk, sing, socialize, and even speak two languages. "Last year when you guys were here, Thomas was basically just saying like 20 words but they weren't even words, they were like sounds...animal sounds," said Thomas's mother Lauren Bernard. "Now he's full on talking. I can totally understand him." Thomas was diagnosed with autisum right before we met him last year. 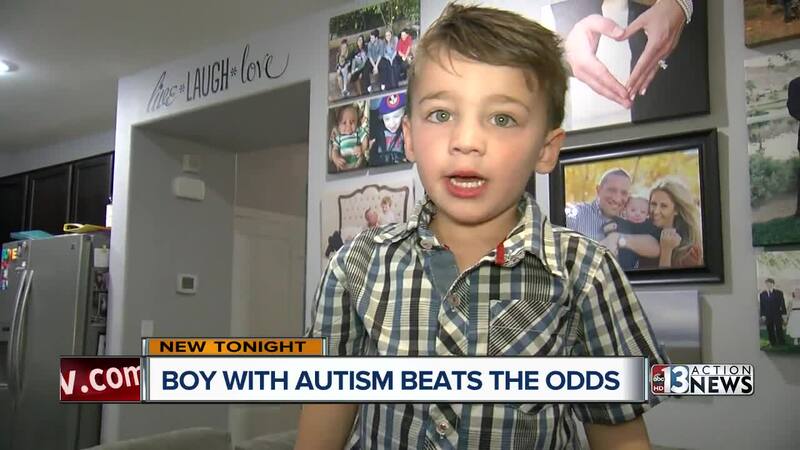 He immediately began ABA therapy. The changes were almost instantaneous. "He can answer yes or no," said Bernard. "He can tell me what he wants. He can tell me how he feels. He just recently started saying when he doesn't feel good or when he's anxious...he says I'm not OK!" Bernard has some advice for anyone going through something similar. "It is so scary and so confusing and you're gonna think you're going crazy but it gets better, it's still hard, but it gets better." She couldn't be more proud of Thomas today. "He's a superstar! Are you a superstar?! Say I'm a superstar. I'm a superstar!"